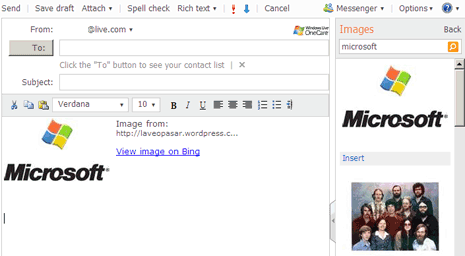 Microsoft has integrated Bing Search content with Hotmail interface. Now you can add any content searched on Bing to your emails being composed and sent using Hotmail. For example, you are writing email to friend about recently watched movie. You can use this “quick add” feature to insert and link that movie photos and review available on different websites. 1. Login into your Windows Live Hotmail account. 2. Click New button to create new email message. 3. On right side checkout Quick add box. 4. Click onImages, videos, restaurants as per requirement. 5. Search for relevant content and click insert button. Specific content will be added to your compose email box with reference link for more information on Bing search result pages. 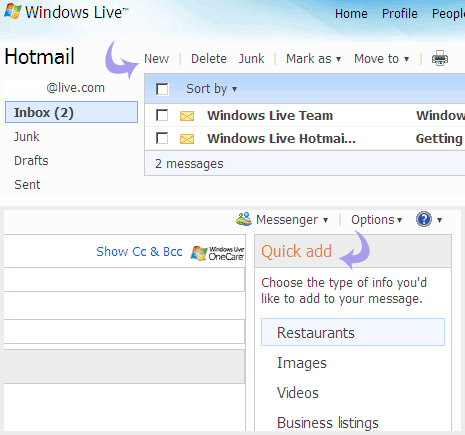 Quick add is a handy feature to add more information to your email composed in Hotmail. Specially the image feature, add as many images you want quickly without any fuss. As pointed by Hotmail Team, this feature is currently available in select areas including: Australia, Canada, China, India, US, and UK. I can’t see the quick add side in my email…!!! please help me..